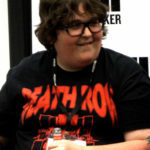 Andy Milonakis is an American actor, writer, rapper, streamer, and comedian. He is best known for creating and starring in The Andy Milonakis Show on MTV and MTV2. In 2013, he began a recurring role as Roman Armond on the Comedy Central sketch Kroll Show. "I’m going to do a lot of weird stuff that’s not going to be like me prancing around like an insane 12-year-old. I showed everybody that side of me and I think it’s time to do different stuff, even when it comes down to the type of humor. I want to do some drier, weirder stuff." "I don’t want to rap about my car. How generic is that? Be creative."